75013 Umbaran MHC is a Star Wars set released in 2013. It includes an Umbaran MHC and four minifigures: Ahsoka Tano, a 212th Clone Trooper, and two Umbaran Soldiers. It is a Target exclusive in the US. The 75004 Z-95 Headhunter can be seen in the MHC's LEGO.com product page animation. This is a description taken from LEGO.com. Please do not modify it. (visit this item's product page) Defeat the Umbaran Mobile Heavy Cannon and gain a victory for the Republic! Take Ahsoka Tano and the 212th Clone Trooper into battle against the massive Umbaran MHC™ on the dark and desolate world of Umbara. 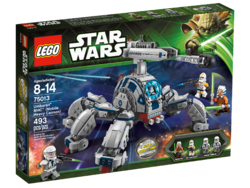 As featured in Star Wars™: The Clone Wars™ animated TV series, this ultra-tough weapon features a swiveling and elevating cannon, opening front and rear cockpits, poseable legs and a missile launcher. Help the heroes take down this heavy-metal monster to clinch a victory for the Republic! 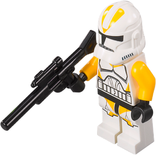 Includes 4 minifigures with assorted weapons: Ahsoka Tano, 212th Clone Trooper and 2 Umbarans. Facts about "75013 Umbaran MHC (Mobile Heavy Cannon)"